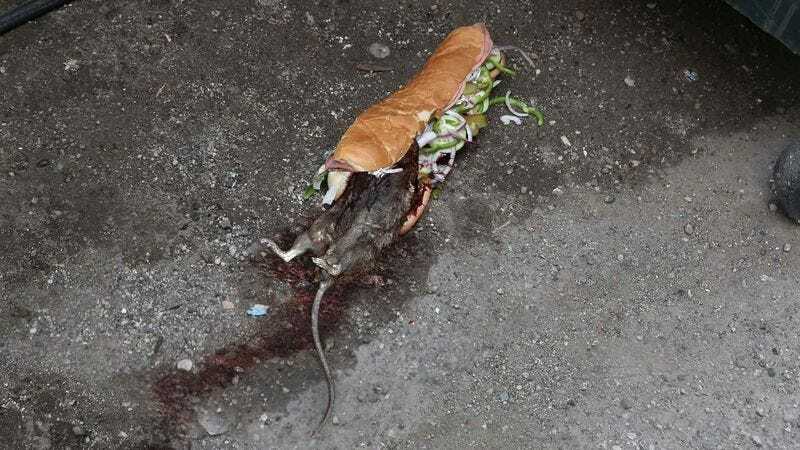 UNION CITY, NJ—Saying the disturbing incident made him sick to his stomach, Subway shift manager Dean Haney told reporters Wednesday he was completely disgusted after seeing a Cold Cut Combo devour a large rat in the alley behind the restaurant. “I went to take out the trash, and I saw this nasty-looking thing just feasting on a full-grown rat,” said Haney, estimating the size of the sandwich as “at least six inches,” and describing it as mangy, vicious, and dripping with Italian dressing. “It completely tore the rat apart before wolfing the whole mess down—I honestly almost puked. The worst part is, if you see one of these things out there, you know there are probably hundreds more around somewhere.” Haney noted that after it finished consuming the rat, the revolting and likely disease-ridden Cold Cut Combo scuttled under a dumpster and into a crevice in the wall, presumably returning to its fetid nest.